Jane Hollowood Associates, based in Manchester, are an agency representing over 50 actors. A bespoke database application, written using Access 2007, manages the invoices and payments for work performed by actors from the agency. 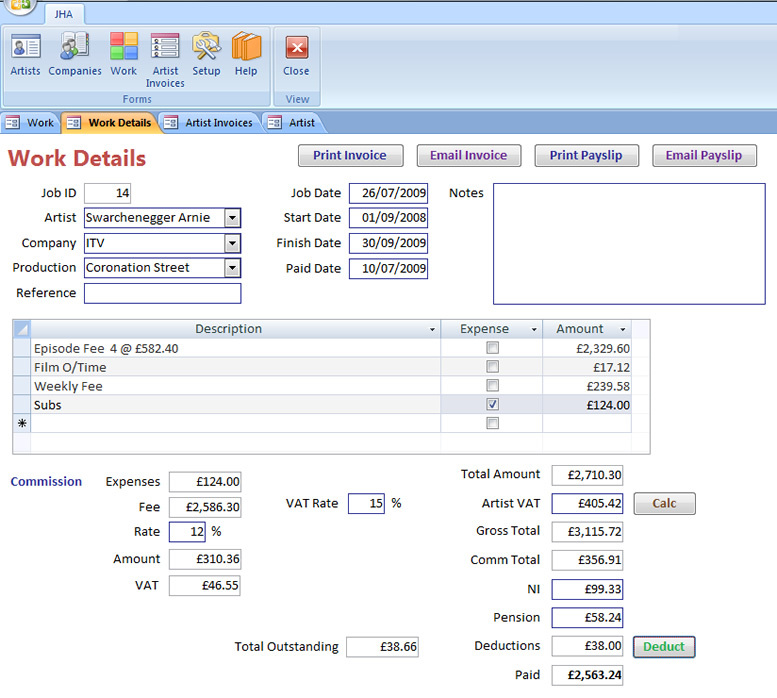 Actors payslips are created using an easy to use screen (see image below). The software manages expenses incurred by the agency on actors behalf such as publicity photos. Jobs and actors invoices are easily searchable and can be exported to excel. Payslips and invoices can be sent directly by email. "I was impressed by how Paul listened to me and created what I asked for rather than what he thought I needed and then, made it better than what I’d asked for." The Voice Box Agency act as agents for voice-over artists performing TV and radio commercials. Each commercial requires two invoices to be produced. One is created on behalf of the artist for their fee from the customer such as an advertising agency. The second is created by the Voice Box for the commission they take from the artist. No off-the-shelf accounts package could handle this requirement for simultaneous dual invoicing and so Paul Stanley Software was commissioned to develop a fully bespoke solution. The client had minimal software expertise and required an easy to use and highly reliable solution. The complete system contains comprehensive accounts management facilities, including end of month statements, handling credit notes, NI returns, debtors report and cash book. Customer and client databases provide mailshot selection, mail merge and label printing.